Intel Readies Merom-based Celeron Ms for Q1 '07? Follow battery usage, storage and charging guidelines found in the user's guide." "A MacRumors forum post by Rokem details a hack for the MacBook Pro fans that can significantly reduce its operating temperature. "Now my processor is 40-50°F cooler, and 5-10°C for all you out of the USA. Battery life is maybe 5 minutes shorter, and the fans are not all that much louder. "Rokem achieved the temperature reduction by modifying the plist files AppleBlower.ktext and AppleFan.ktext. Essentially, he edited the speed values for both fans so they kick on a little sooner and run a bit faster." Link: Reduce MacBook Pro Temperature in Software? "For the past two months, my MacBook Pro and I have been happily - and seamlessly - connected to the Web 24/7, no matter where we've been - be it Boston, San Francisco, Syracuse, Portland or Seattle; up Interstate 5 from San Francisco to Seattle or on Interstate 84 alongside the Columbia River in Oregon. I have been connected, not by hopping on and off available wireless hotspots, but via Novatel's V640 EVDO card and Verizon's BroadbandAccess Connect EVDO service. "EVDO (Evolution-Data Optimized) is a 3G (third-generation) cellular standard currently supported by Verizon and Sprint in the US, and a number of other mobile carriers throughout the world (T-Mobile plans to add support for 3G services next year). Verizon had previously offered a PC Card that let you hook up a PowerBook G4 to the BroadbandAccess service, but it was only recently that a card has been available for use with the MacBook Pro." "Foxconn Electronics (the registered trade name of Hon Hai Precision Industry) has received notebook orders from Apple Computer and will start volume shipments of one new MacBook model to the US vendor by the end of this year, Vincent Chen, an analyst at Credit Lyonnais Securities Asia (CLSA), was quoted as saying in a Chinese-language Commercial Times report last week." "Expect to see the first Core 2 Duo-derived Celeron M processors in Q1 2007, the same timeframe Intel has assigned to the release of low-voltage Core 2 Duo CPUs, it has been claimed by folk who've had a look at the chip giant's latest mobile roadmap." Link: Intel Readies Merom-based Celeron Ms for Q1 '07? PR: CompAmerica has announced its new Snow Leopard Laptop (or SL2 for short) an ultra-lite, ultra-durable little bundle of mobil computing joy. The new SL2 Laptop weighs in at a mere 2.8 pounds, including the battery. Yet is has a wide 12" WXGA [1024 x 768] screen that's fit to play DVDs, watch TV, browse the Web, and everything in between. It can burn CDs and DVDs and is designed for work or for play. 100% compatible with all Microsoft, Adobe, and other PC products, SL2 breaks new records for the Ultra-Light league, the first ultra-light that does not compromise on features. It includes a 4-in-1 memory card reader, for instance, and even has its own built in Fingerprint Reader. With a starting price of $1,399, the SL2 is about 40% less than the price of the nearest small laptop competition. "If you can't manually (or via an application) adjust the brightness or resolution of your PowerBook display in Mac OS X 10.4 through 10.4.2, or if Displays preferences only shows the native resolution of the built-in display, download and install the Mac OS X 10.4.3 Update, or later." "If your MacBook's battery is fully drained of power, the battery will put itself into a low power state to preserve its ability to charge in future. Fully draining the battery might be done by running the battery until the computer sleeps and then leaving the battery in the sleeping computer for an extended period without plugging it in." PR: With 92% of business travelers and over 50% of vacationers carrying a laptop, it's no surprise. According to the World Airline Entertainment Association, success will go to those airlines "Who can provide the best entertainment onboard the airplane. The passengers depend on & expect access." Boeing's Connexion service is re-launched by Panasonic & it's "Ready To Go" - FCC awards air to ground frequencies for in-flight high speed broadband - New PicoCell Satellite Antenna Technologies promise to lower overall weight & costs - SIMS & other games coming soon. Keynamics LLC launched the new Aviator Laptop Stand earlier this year in anticipation of in-flight high speed Internet. In-flight Internet preparations are a boon for this manufacturer of airplane tray table laptop stands, which make using a laptop on a plane more comfortable & productive. The Aviator is the first and only laptop stand designed specifically for both on the go professionals and airline passengers. The stand eliminates the "hunch" and allows the passenger to rest back against the seat for spinal support, achieving neutral postures as OSHA recommends. The Aviator Laptop Stand turns any flat surface into an instant computer workstation for use at the hotel, coffee shop, office, dorm room, or boardroom. Ultra-Compact and weighing only 9 ounces, the stand stores flat in the side pocket of a laptop case. It is universal and fits all laptops. The Aviator is designed to be sturdy and extremely stable to handle turbulence and bumping from other passengers. The stand has been tested to hold 1,500 pounds. It safely extends the keyboard of the laptop 2.5" over the front edge of the tray (or desk), and raises the screen by 3". The keyboard is positioned at a comfortable angle for typing and the screen is raised to the proper eye level for reduced neck bending and back strain. Keynamics designed their stand to accommodate the reclined seat in front, providing room to work comfortably and it avoids being crushed by the sudden recline of the seat ahead. Both the FAA & the airlines are concerned about exploding batteries. The Aviator allows the most unimpeded, open & natural airflow of any stand on the market. Natural airflow conserves power because internal fans cycle less. USB assisted external fans drain batteries while contributing to the overheating problem. Cool batteries do not explode. The Aviator Laptop Stand comes in three colors. Riser Spacing: Outer 8.75", Inner: 5.75"
Riser Top Surface Contact Area 12"
The Aviator sells for $19.99 and has a 30 day 100% satisfaction money back guarantee. PR: Attach. click. connect. launch2net allows you to establish a mobile Internet connection anytime, anywhere. Connect your mobile phone, USB-modem, or PC datacard to your Macintosh computer and run launch2net. launch2net features an automatic setup routine and already includes all necessary network settings. Just click "connect" after the automatic setup process and you are online! launch2net supports many mobile devices used by mobile network carriers worldwide. The software supports high-speed HSDPA and 3G UMTS connections as well as standard EDGE and GPRS protocols. PC datacards, USB-modems and mobile phones: launch2net supports most mobile devices of all major manufacturers as well as most mobile network providers worldwide. Check with the links below to see if your device and network is supported. PR: In light of the recent laptop battery recalls, users who are waiting for replacement batteries can turn to Valence Technology, Inc. to supply batteries. Valence's N-Charge Power System offers users up to 10 hours of battery runtime with the safety provided by Valence's patented Saphion phosphate technology. Unlike traditional cobalt oxide Lithiom-ion batteries, Valence batteries are made using a patented phosphate based cathode material. Phosphates are stable in overcharge or short circuit conditions and have the ability to withstand high temperatures without major incident. Using Saphion technology means Valence batteries in normal use and conditions are unlikely to be subject to "thermal runaway" that can cause fires. As a result, Saphion technology possesses safety characteristics that are fundamentally superior to those of cobalt oxide Lithium-ion batteries. Valence's N-Charge Power System is a universal, external battery that provides up to 10 hours of continuous runtime for notebook computers including many models from Apple, Dell, Fujitsu, IBM, Lenovo and Toshiba. Valence's VNC-130 battery offers up to 10 hours of runtime and can be used as the primary power source for the laptop instead of the internal battery. Laptop owners concerned about being restricted by airline carriers from carrying on their laptops can remove the restricted internal battery and carry on an N-Charge Power System to power their laptops in flight. The N-Charge Power System provides safety in a long lasting adjunct to traditional laptop batteries and easy-to-use, anytime, anywhere power. Valence's N-Charge Power System is regularly deployed for a wide variety of uses in educational settings, including K-12 schools, and healthcare settings, including hospitals, where extended runtime of laptops is required. The N-Charge Power System helps to free notebook computer users from ties to AC power, improving both mobility and productivity. A complete list of laptop models supported by the N-Charge Power System can be found on Valence's web site ( www.valence.com ). N-Charge Power Systems can be ordered directly from Valence via the web site or by calling 888-VALENCE. The N-Charge Power System is also available through a variety of computer suppliers including CDW, Dell, InfoLogix, Insight and PC Connection. My Sleeve has been designed to make it easier for you to achieve the effect you want. Before applying your design, remove your laptop. Cut a thick piece of card and push it down into the sleeve so it stretches the canvas and gives a flat surface to work on. Create your design and then reseat the lining, making sure it overlaps at the bottom of the sleeve. The lining creates a protective layer between the canvas and your laptop. You may want to prime canvas before painting and seal your design with a waterproof coating afterwards. Make sure to allow your design to dry completely before re-inserting the lining and using your sleeve to carry your MacBook. PR: US Diversified Tech, LLC becomes one of the newest promoters of the S.T.O.P. (Stop Theft of Office Property Security Plate. Laptop security concerns every laptop owner. STOP is in the business of protecting your mobile equipment, which includes laptop theft prevention. STOP's anti-theft system is a unique patented protection that solves the problem of equipment theft by eliminating the reason for most theft: "The resale value." More than 1,700 computers are lost or stolen every day. 97% of them are never recovered, according to the FBI. Data stored on the devices - customer lists, financial data, and correspondence is critical. Professional thieves are not interested in the laptop or notebook itself, only its resale value on the open market. STOP's security system reduces the street value of the item to zero. Someone finding the device at an airport, or an employee who might consider keeping it on "permanent loan" is motivated to return it. 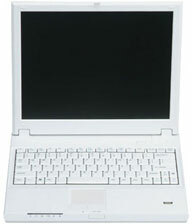 STOP's anti-theft system, also, effectively protects notebooks, Blackberrys, PDAs, cell phones and other mobile equipment. Every piece of equipment protected with a STOP Security Plate is automatically registered with STOP. Registering your STOP Security Plate number and pertinent equipment information is critical for equipment and especially for notebook or laptop recovery. All of these and many other Laptop Theft Deterrent products are available from US Diversified Tech, LLC on their website or by calling 888-361-8718. Government & most all Educational Purchase Orders accepted without prior authorization. new 2GHz MacBook, black, $1,399.99 after $100 rebate.